Russell Hatter, the assistant curator of the Capital City Museum in Frankfort, Kentucky, sent us this newspaper clipping from the Kentucky Journal of September 8, 1903. 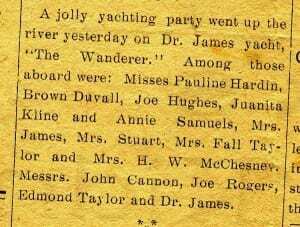 The story documents a day cruise on the Kentucky River aboard Dr. James’ yacht The Wanderer. 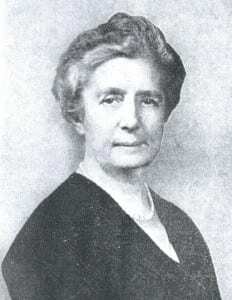 Among the guests, the article identifies Sally Jouett Taylor, Dr. James’ wife. After Dr. James died, Sally married John Stout Cannon, whose father is the famed riverboat captain John W. Cannon, whose steamboat Robert E. Lee raced against the steamboat Natchez, thrilling all of America. Capt. Cannon is also on the guest list of the cruise. Also aboard is Dr. James’ mother-in-law, Elizabeth Sarah Fall-Taylor, and brother-in-law Edmund Haynes Taylor Jr. Edmund Taylor was raised in the home of President Zachary Taylor. 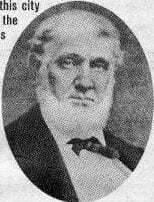 He had been a Kentucky State Representative and a former Mayor of Frankfort, following the mayoralty of Dr. Evans’ father A.J. James. At the time of the cruise Taylor was manufacturing Old Taylor brand whiskey. H. W. McChesney was a justice of the peace at the Frankfort court, who later relocated to Chicago. Other identities are unknown. A bevy of your girls is also on the cruise. Among them is Annie Samuels whose identity is unknown. She is presumed to belong to the Samuels who lived in Frankfort, who were related to Dr. Reuben Samuels, the second husband of Zerelda Elizabeth Cole, with widow of Rev. Robert Sallee James. 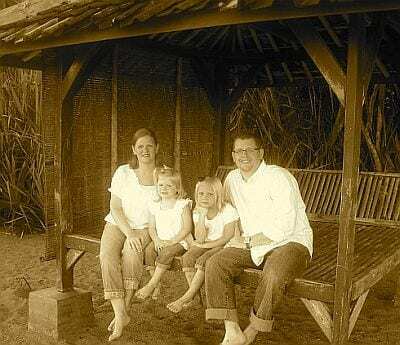 About a year ago Doug and Sara Whitaker moved to Indonesia with their two daughters Bailey and Kylie. Ever since, they’ve been blogging and posting pictures about their adventure. The title of their web site is Our “Every Tribe.” Be sure to check out their Wants & Needs section. They’ve found some necessities are not found in foreign lands.